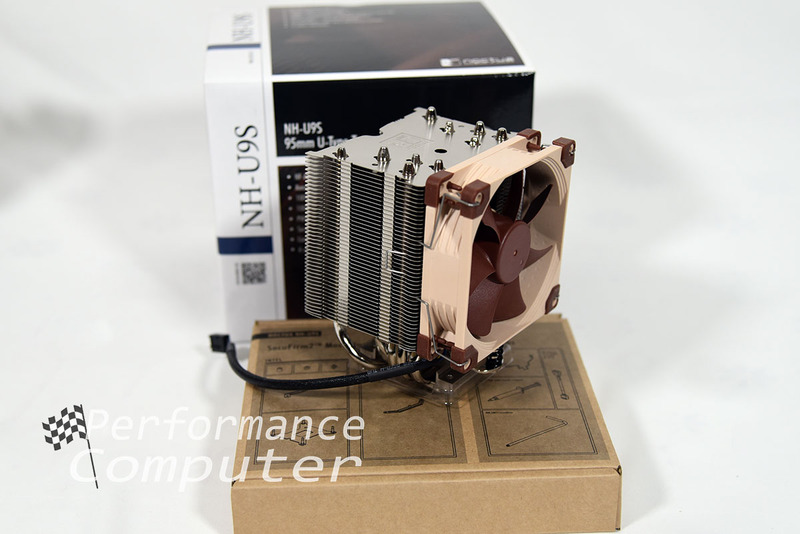 Today we are reviewing the Noctua NH-U9S CPU cooler. 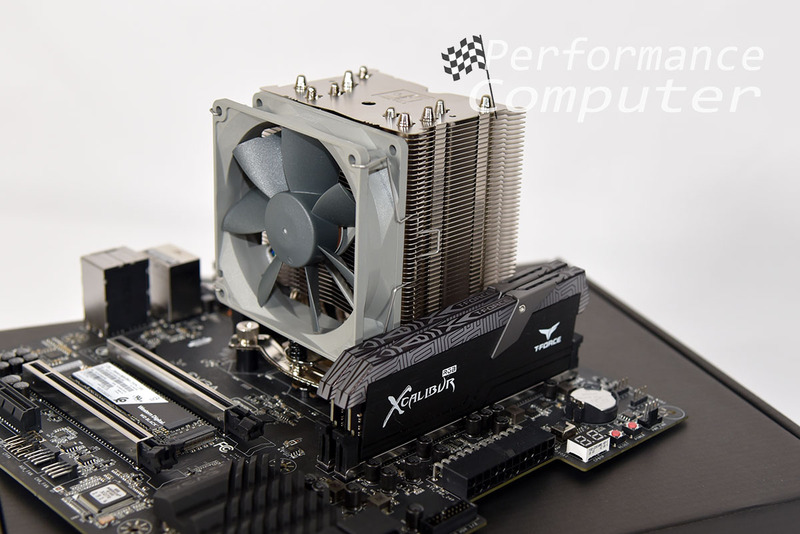 It is among the best cooling solutions for smaller systems such as ITX based builds, providing excellent cooling performance in a tiny footprint. 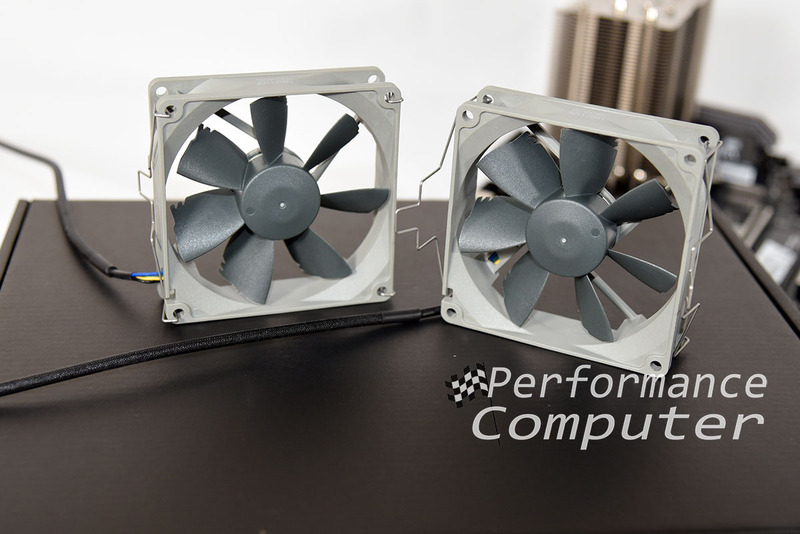 We will be running the U9S in a dual fan configuration with two Noctua NF-B9 redux-1600 PWM 92mm cooling fans. 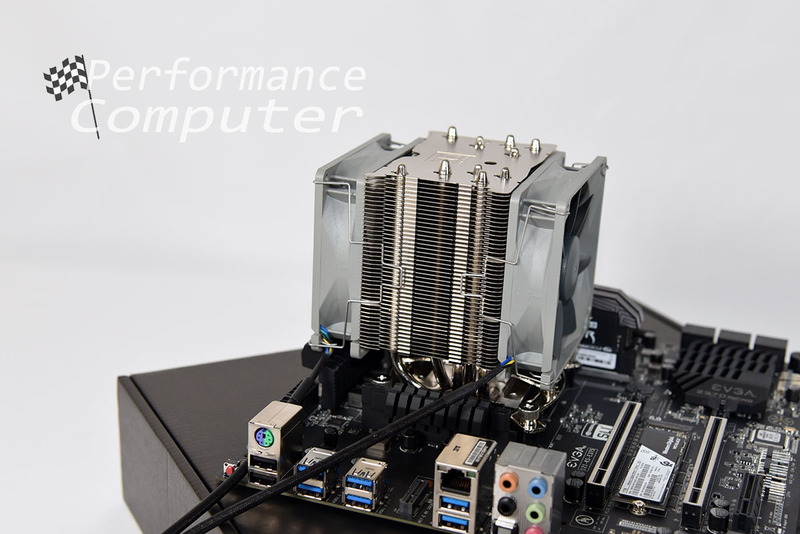 This is one of the most preferred configurations and often seen in high-end ITX builds in cases like the Ncase M1. 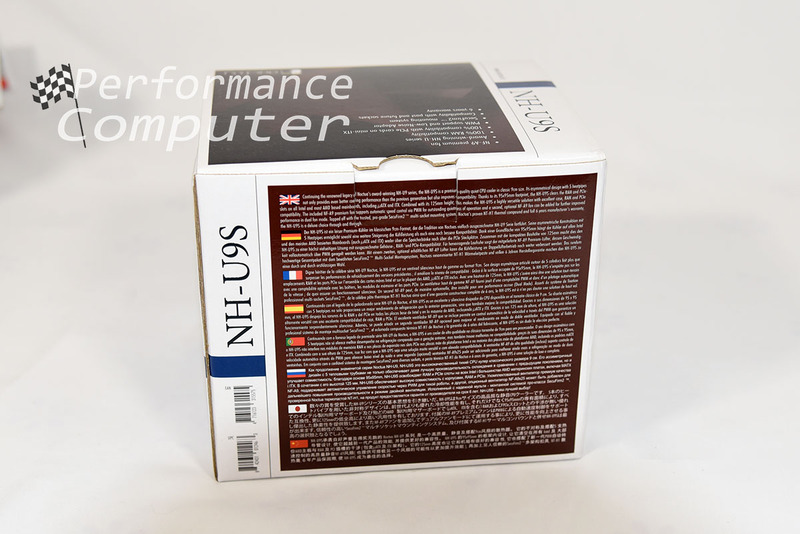 The front of the box includes Noctua’s branding as well as a bulleted list of features such as 100% compatibility with both RAM as well as PCIe cards on mini-ITX systems. The back of the box includes a detailed product description in several languages. Here is the U9S with the included 92mm PWM controlled fan. 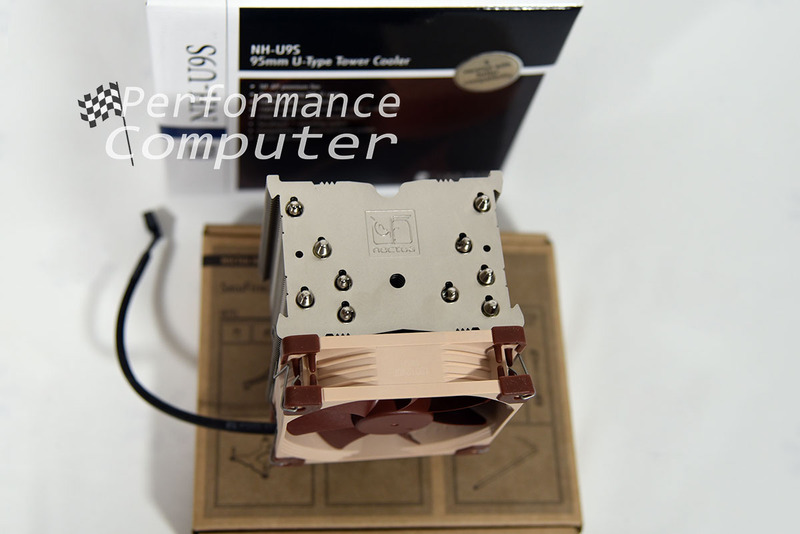 This is a tiny heatsink but Noctua managed to pack quite a cooling punch in this unit as we will later demonstrate. The top of the heatsink has Noctua’s logo and you can see the tip of each of the five heatpipes running from the bottom to the top of the heatsink. 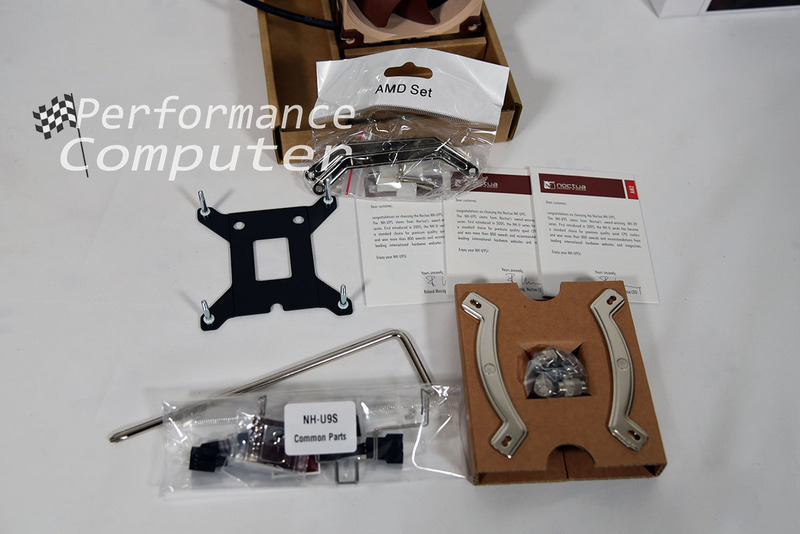 Noctua generously includes everything from the required mounting bracket and backplate to thermal paste and a special screwdriver tool to aid with installation of the U9S. Speaking of installation, the first thing we did was swap out the stock for two of Noctua’s NF-B9 redux-1600 PWM fans. 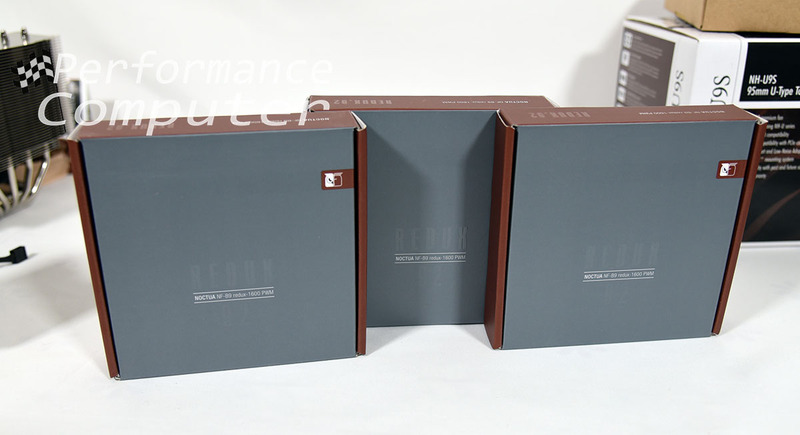 Noctua’s redux lineup comes in a beautiful space gray color which looks quite well in person. Even the box for the redux fans is impeccably designed. 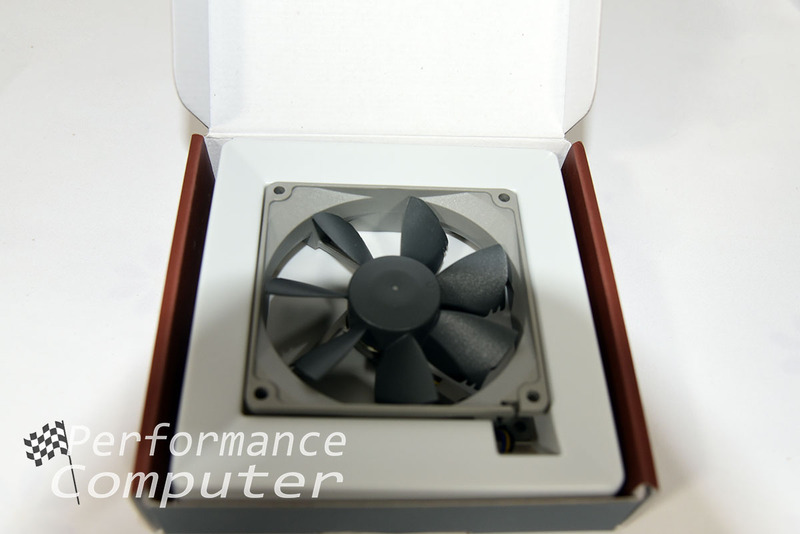 The front of the box sports a gray/brown color theme and displays Noctua’s logo along with the model number of the fan. The back of the box displays pertinent information such as fan dimensions, rotation speed, noise and pressure. Here you can see the packaging, the fan is secured in its tray. 4 fan screws are included with each fan. Despite the numerous components, installing the U9S is quite simple. Noctua’s instruction manual makes the installation process easy with detailed instructions as well as colored graphics. 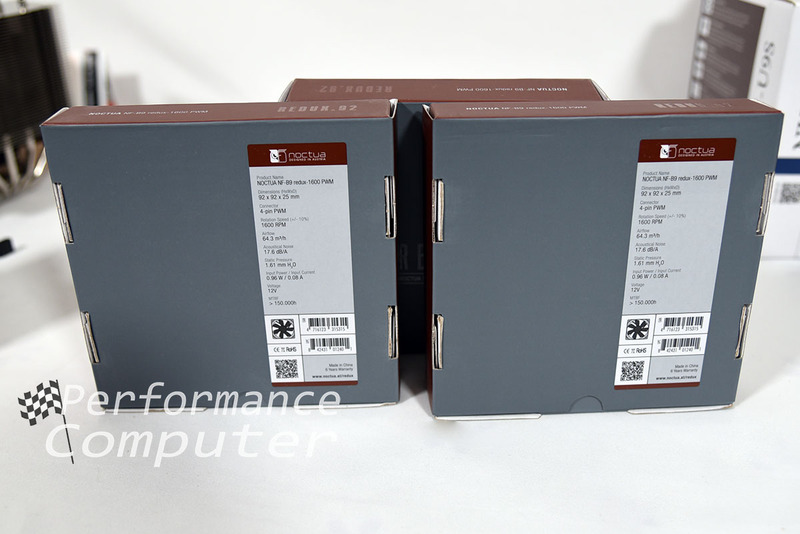 Noctua’s inclusion of the colored brochure-manual complete is very welcome as many high-end components don’t even come with manuals or require you to go online to locate the documentation which is very frustrating. 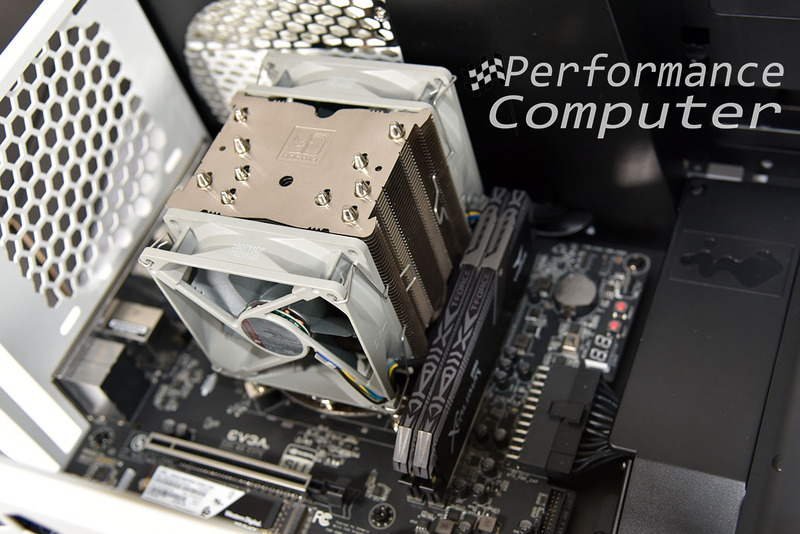 First, install the included backplate on your motherboard by lining up the cut-outs on the top and bottom of the backplate with the motherboard.Next, you install the mounting bars onto the backplates bolts which can now be accessed on the primary side of the motherboard. The included spacers go over the bolts, then drop in the mounting bars followed by the screws. At this point you can choose either a vertical or horizontal orientation for the heatsink depending on preference or possible space limitations. 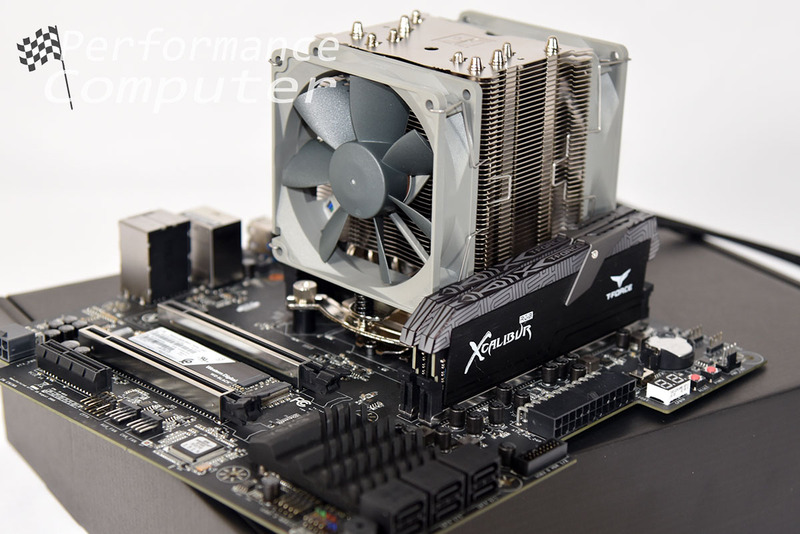 It is also easiest to remove the fan prior to installation of the heatsink. 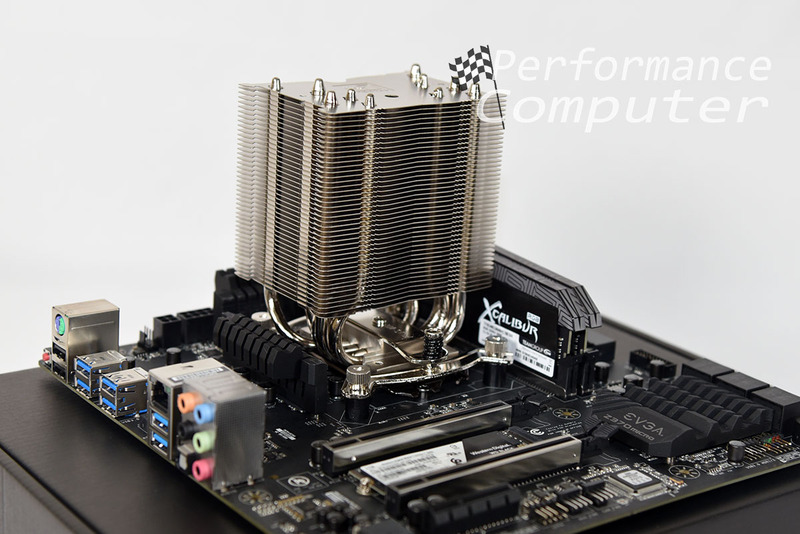 After the mounting bars are secured, apply thermal paste to your CPU and fasten the heatsink to the CPU. The heatsink will line up with the mounting bars and is secured via two screws. This part may take a bit a patience as you need to hold the heatsink down with some force while you start the two screws. The included screw driver tool is invaluable here. Next, we transferred the steel clips from the stock fan to one of the redux models and added the second set of clips to the second redux fan. Here’s the U9S with the first redux fan clipped on. It’s a tight fit next to our 8.8mm tall Team Group Xcalibur RGB RAM but it does fit. Second fan added for maximum cooling potential. Here’s the back of U9S installed on the EVGA Z370 Micro ATX motherboard. Another shot of the RAM clearance of the U9S and Xcalibur RGB RAM. The U9S performs quite well despite its small stature. In our dual fan configuration, cooling a non-delidded Intel Core i7-8700K at stock speeds resulted in 37-38°C idle temperatures and 68°-72°C load temperatures. This was in our In Win 301 tempered glass case. When idling on the Windows desktop and in light load situations, the U9S runs near silent. Tempered glass cases tend to result in hotter temperatures compared to non-glass cases and when we removed the side panel, temperatures dropped 4°C on average in all scenarios. 68°C might seem a bit toasty but keep in mind the 8700K runs very hot, especially when it’s not delidded. Delidding can drop the load temperatures by as much as 20°C and if you’re planning on extreme overclocking, we’d always recommend it. Our upcoming delidding guide will explain this in more detail. The Noctua U9S heatsink is a high-quality product that performs excellently, is incredibly well made and comes with a confident 6-year manufacturer’s warranty. 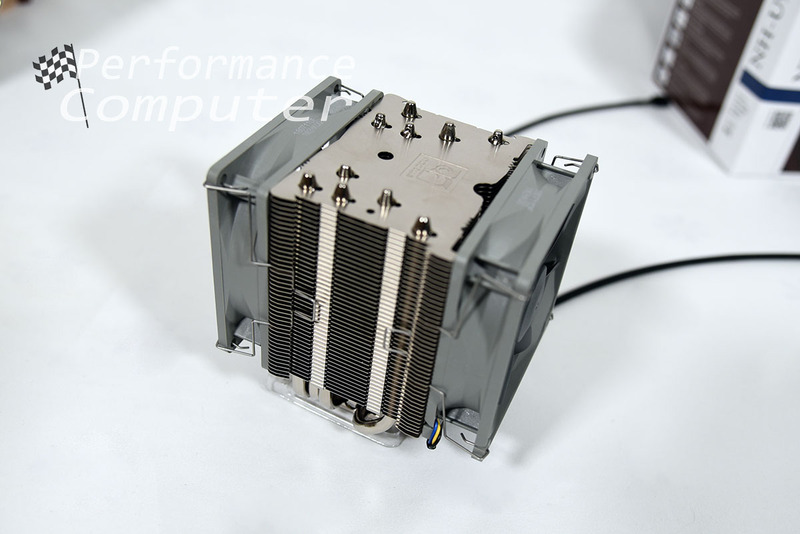 We highly recommend this CPU cooler for those looking to cool high TDP processors such as the i7-8700K in small ITX cases like the Ncase M1. We also recommend the U9S for those who want silent system that won’t require any maintenance whatsoever. 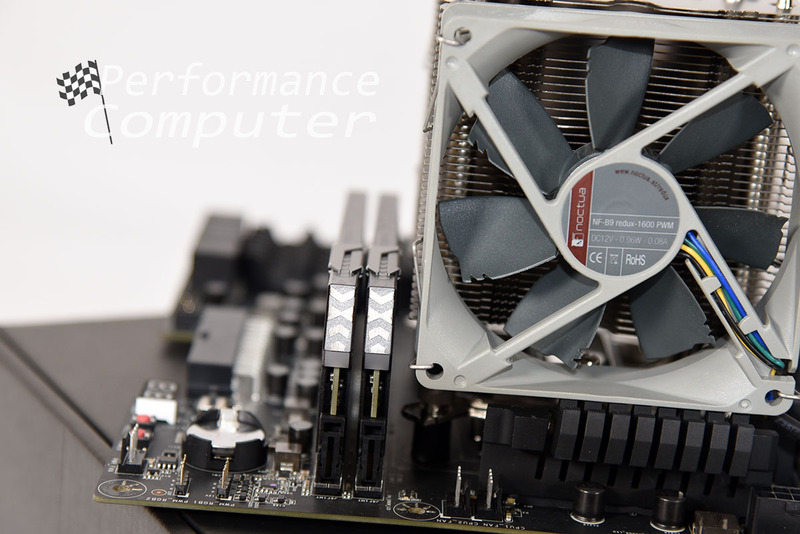 The U9S excels in both scenarios and is an overall great value for any system building purchasing a new CPU cooler. 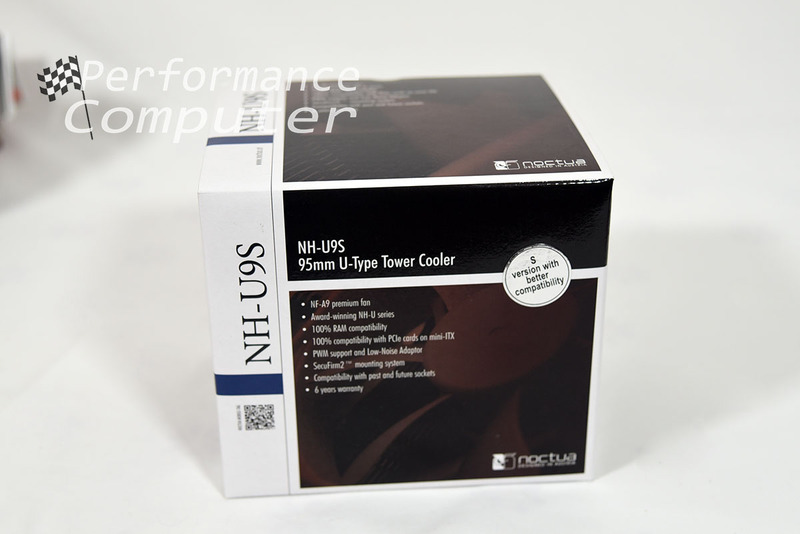 Just as we experienced with the NH-D15S, Noctua’s superior quality and performance in both heatsinks and fans ranks them among the best in the industry.